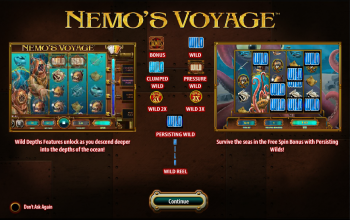 Relive your favorite deep-sea adventure story with Captain Nemo in Nemo's Voyage slot and take home massive rewards. 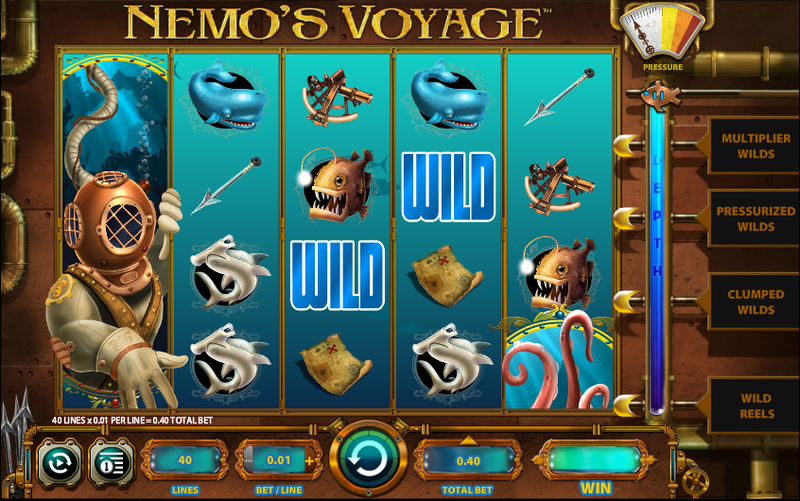 The slot has a curious layout with 5-reels and 40-paylines, but with 4-rows as opposed to the usual 3. 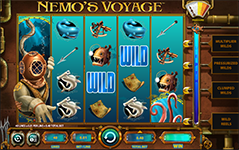 Relive your favorite deep-sea adventure story with Captain Nemo in Nemo’s Voyage slot and take home massive rewards. 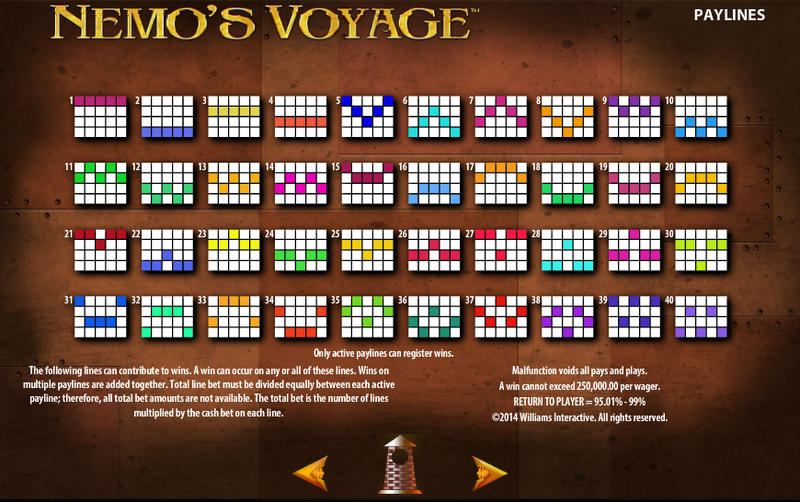 The slot has a curious layout with 5-reels and 40-paylines, but with 4-rows as opposed to the usual 3. The symbols on the reels are fitting for a slot with such a theme. Harpoons, Maps and Telescopes, grace the reels and offer big prizes. Bigger still are the rewards for spotting dangerous sea creatures like Hammerhead Sharks, Whales and the famous Giant Squid. 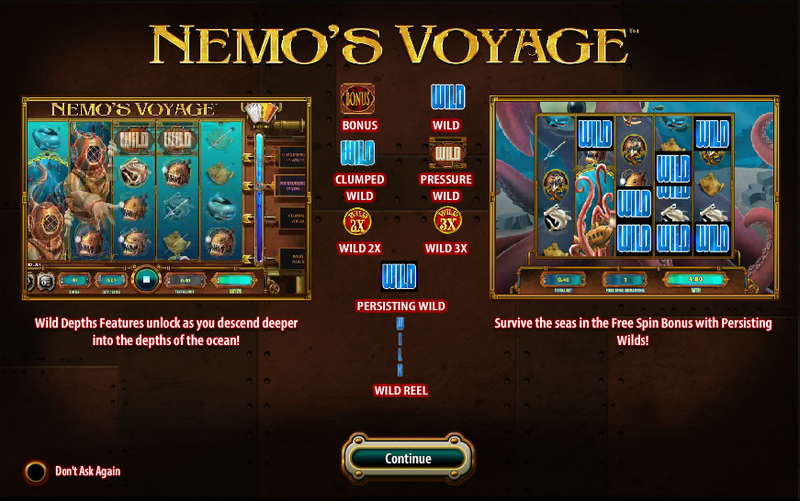 A neat feature of Nemo’s Voyage is the Pressure Indicator on the right side of the slot. 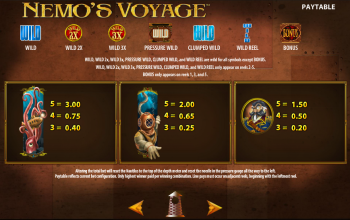 Each spin of the reels moves the pressure indicator inside Captain Nemo’s ship and when it hits certain pressure-levels you will be awarded a variety of fun bonus games including Wilds, Pressure Wilds and Clumped Wilds. 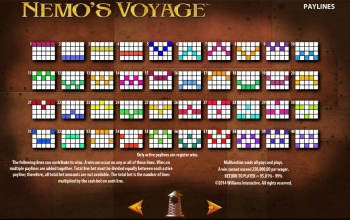 A Voyage on the Nautilus with Captain Nemo doesn’t have to cost you much with bet sizes to fit players of all betting ranges. Once aboard the Nautilus you’ll spend your time looking out of its portholes where you can view enchanting sea life including sharks, squid and whales. But first, you’ll need to find treasure hunting tools like maps, harpoons and telescopes to start snagging your adventure prizes. Spotting sharks and whales will get you up to 500 coins, while electric fish will get you up to 625 coins, and giant squid up to 1,000 times. Each spin of those wheels will then move the Nautilus’ pressure gauge into one of the bonus sections which include great features as varied as the life in the sea. You might see a normal Wild, Wild x2 multiplier, Wild x3 multiplier, Pressure Wilds, Clumped Wilds, entire Wild Reels and Bonus Rounds. 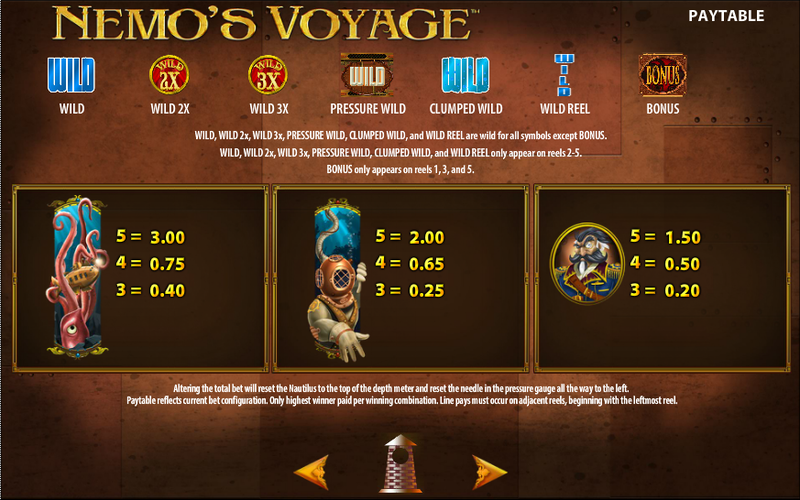 If the Wild bonuses are triggered, the wild symbols will substitute for all base symbols while hitting the Wild x2 or Wild x3 will do the same but multiply winnings by the respective multiplier. Clumped Wilds will form clumps of wilds on the reels and wild reels will see wild symbols freeze on reels 1 and 3. If the bonus symbols trigger the bonus then you will receive a random amount of free spins, during which the giant squid may surface and grab a reel to turn it into a wild reel.